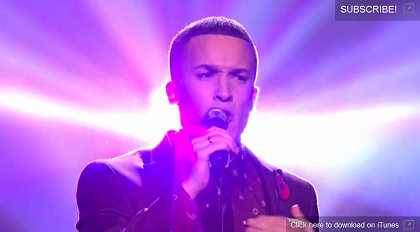 In retrospect, Jahmene Douglas was a casting dream for producers. The diffident Swindon lad with more tragic backstories than a veteran soap character has a narrative that fulfils two classic X Factor plots: overcoming adversity and the journey to confidence. With so many sob stories to choose from, producers started off his first audition not on childhood abuse, domestic violence or his brother’s suicide but with a Subo-esque focus on his lack of self-belief, strange mannerisms and humble background. He nervously giggled five times in the first 20 seconds of VT, then explained “I’m the biggest worrier” and “I feel like I’m going to wee myself”. All this gave viewers the requisite “shock factor” as Tulisa put it after he had finished ‘At Last’. “You were like this timid little soul and you couldn’t actually express yourself, until you started singing,” Tulisa also said, as the incidental music to ‘Forrest Gump’ started up. Jahmene, dressed in a rather Gumpesque grey suit and buttoned-up white shirt, was last seen shuffling into the distance arm-in-arm with his Sally Fields-like mother. 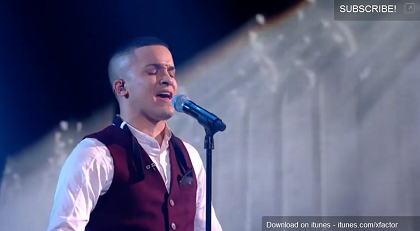 Was Jahmene seen by producers as a potential finalist at this point? At Sofabet we have given some credence to the idea that he only emerged as one because he was an effective ‘sink Chris’ candidate. After all, the gospel singer has never looked particularly marketable. But re-watching Jahmene’s audition there’s a significant clue that we failed to register at the time. Take a look yourself and pay attention to the judges’ comments. Can you find it? Nicole reckons Jahmene is “world class” and could sell records everywhere. World class is shorthand on the show for ‘deserving finalist’. “We’re looking for a worldwide recording artist,” is how Louis usually puts it. Ella got this tag repeatedly. Jahmene was given it at the very beginning. Not picking up on this, and without the benefit of hindsight, we had Jahmene down as a shock earlyish exit during the live shows in our 1-13 prediction. We weren’t alone – in the comments section to that article, plenty (though by no means all) of those sharing their estimates agreed. Ma Scherzinger gave him some home truths at judges’ houses by telling him to “grow some balls”, which she could claim he’d done after his week 1 rendition of ‘Imagine’. His VT that week was all about overcoming nerves. “I’m feeling a lot more confident,” he explained. 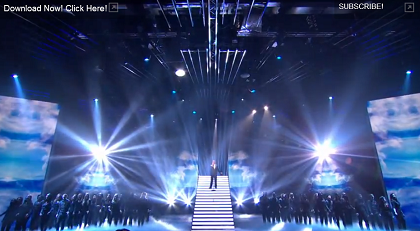 To reinforce what with hindsight should have been a growing suspicion that Jahmene was an intended finalist from the off, he was given the first live show’s pimp slot, winner’s lighting and the winner’s walk to the audience. The last we saw of Jahmene that Saturday night he was again being mothered, this time by Dermot ruffling his hair. This became a running joke when referenced in week 2. The second live show was all about boosting Jahmene’s ‘awwwwww’ appeal. The VT revealed he had never had a girlfriend, he was then styled in a white suit which Dermot and Tulisa said made him look “confident” and “dapper”. But if his appeal to maternal instincts across the country wasn’t sealed yet, it certainly would be. Week 3 witnessed an incredibly moving VT about domestic abuse suffered by his mother during Jahmene’s childhood. He explained that singing had become his sanctuary and broke down after his rendition of ‘Say A Little Prayer’. This was the context in which two judges explained he was “here for a reason”. It would be week 5 before Nicole explicitly said, “you inspire so many other people”. In the meantime, Jahmene had been campaigning against domestic violence. He had become a champion of downtrodden women. From there he has moved onto helping children and young people. Judges’ comments remained incredibly positive but stepped up a gear after his week 4 rendition of ‘Killing Me Softly’. Louis’s remarks that Jahmene was “his favourite singer in the competition by far”, “a-mazing”, “world class”, “only 20” (he’s not but when did the facts stop Louis?) and the classic “you remind me of …*insert soul singer’s name here*” became interchangeable at this point, like a set of cue cards shuffled for each performance. Tulisa lost it in a most bizarre manner after the week 5 interpretation of ‘Listen’, with Louis choosing “world class” among his stock phrases. Both said he deserved to be in the final, because subtext is usually not enough on X Factor. At this rate, they should give Jahmene the full Nativity for the final. The Christmas song gives the show every opportunity to go to town (Bethlehem) with ‘Away in a Manger’ or something similar. I want shepherds, the three wise men, Mary, Joseph, the crib, hay on the floor, animals – the works. Meanwhile, reminders of the confidence journey continued. He was hard on himself in the week 6 VT over his rendition of ‘Listen’ (he was far more honest about it than the judges had been). His week 7 VT during the EuroDisney trip was about what good friends he had made with the other contestants. This was the lad who had admitted in his audition VT that “I’m a stay at home kind of guy. I don’t mingle very well.” No more, thanks to the caring bosom of the X Factor family. Family was the subject of another incredibly moving VT in week 9, focusing on his brother’s death at a young age. The journey from workaday obscurity carried on as well, notably in the hilarious and inspired week 5 VT when Nicole discovered that good food costs less at Asda. Incidentally, Nicole’s star turn here and in many other moments has done nothing but help Jahmene. It will be fascinating to see how their duet comes off in the final. 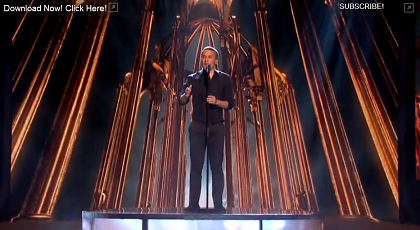 We were reminded in week 9 that success on the show meant that Jahmene would never be stacking shelves again. The semi-final was a return to the full-on pimping Jahmene had received for most of the live shows. I did speculate beforehand why weeks 7 and 8 were not so overwhelmingly great for him. They followed just after a story suggested Jahmene had refused to sing a group number that glorified drinking, Katy Perry’s ‘Last Friday Night’. This was one of the only articles about him which seemed less than totally positive. But in week 9 as well as the emotional VT, the choir returned and most importantly he got to perform his feted audition song. He was also recoupled in the running order with Christopher. It was operation ‘get Jahmene to the final’, as several of our commenters noted. All in all, Jahmene’s journey has been a highly coherent one, and – although different in degree, given just how much he has overcome – a very conventional one by X Factor standards. As we have stated before, he is this year’s feelgood contestant. Which again makes me wonder that, amused by the initial Forrest Gump references, we may have been guilty of missing the signs that he was meant for the final from the very start. But what of his prospects in that final? Counting against him, we have to return to the idea that commercially speaking, Jahmene seems less Jah-mazing and more Leon Jah-ckson. But producers would probably prefer his feelgood victory to a Maloney one. So much depends on whether he is the most effective AntiChris in the final. If he convincingly beat James in the semi, producers will probably feel like a Jah-motional victory is their best option. If not, they’ll look to the lad from Saltburn instead. What’s your opinion on this and Jahmene’s journey in general? Do let us know below. I’m not sure how my prediction ended up, but I always thought Jahmene will do quite well, saw him as an endearing innocent boy to awake protective instincts in viewers, with a decent enough voice to carry him. I more likely expected James to be the shock exit. The problem with this argument is that Jahmene isn’t a great singer and X Factor viewers verifiably don’t like edge. The theoretical existence and magnitude of a potential “anti-Chris” vote, and whether it could even have a hope of significantly countering the pro-Chris vote, is an interesting point of discussion. I could definitely see James getting an anti-Chris vote because James and Chris represent polar opposites. However, James is the least popular of the finalists and remains most likely to exit third. I can’t see Jahmene picking up an anti-Chris vote to the same degree as him and Chris occupy a far more similar space. Viewers that like James and perhaps also liked Lucy and Ella are more likely not to vote at all in the final two stage than to transfer their “credible” vote to Jahmene. With their chosen acts out, they wouldn’t care enough either way about who wins and they certainly wouldn’t be invested in “stopping” one from winning over the other. A lot of what you say is often spot on, but to claim that Jahméne “isn’t a great singer” is absolutely ridiculous. He was the only act to smash both of his performances last weekend, by the way. Have you watched it yet? No I haven’t watched week 8 or 9 yet. I know you’re a Jahmene fan but judging by a lot of comments on here and elsewhere, I’m far from the only person who doesn’t think he’s a good singer. His voice is reedy, he lacks control and he oversings. I would say is far from a great singer also. if he was a great singer we might not need to know all his backstory (presented at gunpoint at this stage). Do we need to know an entertainers back story really? His past has been drip fed to achieve maximum effect in a callous considered way and I hope he comes third because of it. Every negative thrown at Chris has been matched with positives for Jahmene. it is seeking sympathy to win an entertainment competition. if a young Michael Jackson came on X Factor I reckon he would not need to revert to an upbringing sympathy plea as he was a great singer/ entertainer and would have won without “tactics”. It may well be lack of votes have forced their hand with Jahmene. They can tell us all they want how great he is but many are not buying it. Imagine a full hour of Jahmene singing…it would be unbearable. Love “presented at gunpoint”. Just about sums it up. I don’t hold this against Jahmene at all, but the way the show has squeezed every last drip of pathos out of his biography is crass in the extreme and beyond cynical – “callous” and “considered” are the perfect words. I know it’s hardly comparable as a sob story but (for instance) I don’t believe we ever heard about Amelia’s Type 1 diabetes on the show last year. You’re right about the full hour too. Soz Tim, but I have to side with Euro on this one. The way I feel is that there’s a big difference between being able to stretch your voice to uncomfortable places and being a good singer. 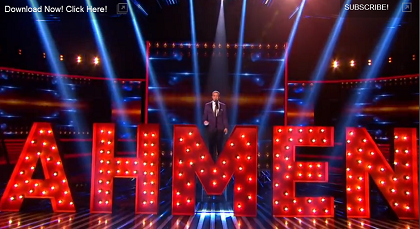 Of the three finalists, I’m yet to hear Chris or James hit a real dud note in the way Jahmene does quite regularly. But in terms of public perception jahmene looks like the best singer because of his vocal acrobatics and its public perception not musical pedantry that will decide the thing. I was always undecided about what Jahmene’s journey on the X-Factor would be. On the one hand he ticked all the boxes for the ideal X-Factor contestant of yesteryear: clean cut, loves his Mum and has confidence/self-belief issues. But he reminded me too much of Joe McElderry and I thought the show wouldn’t want another winner like him, especially in the supposed “credible” year. It would have been easy to dispatch him by portraying him as odd rather than endearing in VTs and critcising his singing being out of tune (which has been parodied well in the Fix Factor cartoons). I think he was “lucky” to have the kind of back story that is loved by TV. And the fact that he’s actually doing something productive with his tragedies makes it hard to be cynical. Sure, he’s not cool like James is meant out to be, but since when has the X-Factor been a cool show despite its pretensions. I think he could easily walk the final with the right song choices and the feelgood factor of voting for a nice guy who deserves a break. The duet could be very helpful if they sing a ballad and Nicole plays the big sister type figure rather than the vamp. While I agree with you, Joe McFlurry was more versatile, more mainstream and more heartthrobby than Jahmene is. He also topped the vote in each of the three weeks before the final (weeks 7-9), which as far as we know, Jahmene hasn’t. One thing maybe worth mentioning is that Jahmene was also addressed in the voting leak, always as second after Chris. That happened since the beginning and before the first violence victim story but also after. That would mean the stories didn’t make him better or worse rg voting which I find curious. The thing is with Jahmene – he may have the backstory, and the growing in confidence, but – and this is a big but – he still sounds like a cat being strangled when he sings. It’s horrible. In this year of credibility and authenticity, I just can’t see them letting anyone but James winning. Completely agree with your first sentiment, completely disagree with your second. The concept of the show not “letting” anyone but James(!) win is highly problematic – what makes you think they have that much control (especially given what we’ve seen already this series) that they could prevent either Christopher or Jahmene winning, given we’ve established that both are more popular with voters than James and have been throughout the series? Remember, the show’s steered not controlled – they have a limited spectrum in which they can act and they can only boost or dampen an act’s vote to a certain degree; their established viewer popularity counts for more. Often these tactics don’t even work as intended either, as dampening attempts can create a sympathy effect and pimping can lead to an act being considered safe or a shoe-in. James is the most likely to come third but it’s far from certain. I saw Jahmene as someone who can sing great but only limited to a certain type of music which he does all over again. There is a public for this of course but I thought it’s going to be bored by it at some point. It’s time to stop thinking in misleading terms of who the show will “let” (*rolls eyes*) win and go with the evidence. Eoghan Quigg topped weeks 1, 2, 3, 4, 5 and 7 (week 7, I believe, is the last week for which we have a Daily Star leak telling us Chris topped the vote this year). In week 7, Eoghan won with 31%, more than double the vote of Alexandra (who was 4th with 15%). JLS (with 12%) were fifth, in the bottom two, like James was in week 7 this year. In the final, Eoghan got 14%, JLS 37%, and Alexandra 49%. I’m not saying it’s a direct comparison, of course, just that it’s a precedent to consider. Thanks Andrew. I’ve been thinking about the Eoghan Precedent a lot. For a number of reasons (which I’m not going to list here but which number into double figures), I believe this year is a different situation and less superficially comparable with 2008 than it may appear. Furthermore, James was 5th out of 6 in week 7.This was the first week they attempted to ‘Matt Cardle’ him by making him more safe and voter-friendly. Also, Jahmene had the “best audition we heard” (Gary’s rationale for giving him “another chance” after he messed up at bootcamp). Well I’m biased as Jahmene’s been my favourite since Day 1. Partly because I’m glad to see a Christian get publicity who isn’t a total wimp or nutjob (and I’d challenge the article that refusing to sing Katy Perry is negative – it’s great for the demo as it shows principle and balls) partly because of the lack of normal pop star mannerisms (saying he messed up after the judges have praised relentlessly) maybe I’m a sucker for the feelgood stuff, he’s also the best result for me in the win Market and has been all along. But he feels like the only finalist who has gone to plan. As you say a coherent journey and surely about to finish by singing Silent Night on Saturday. He probably should be odds on; it’s likely he is well ahead of James in the voting and my guess is that SyCo could shift plenty of records of Gospel music if they wanted, so he’d be a much more acceptable winner than Chris. If Jahmene qualifies as not a “total wimp or nutjob” then obviously the bar isn’t being raised very high here… no, I’m being harsh, I’m sure he’s lovely. Agree with you on the Katy Perry (refusing to sing one of her songs is a positive in my book too), though that song’s hardly her worst. Tim has pointed out to me that SportingBet are offering 1.73 for “Chris to mention his nan”. Licence to print money. Must be direct to Dermot during post song interview, still seems likely but margin for error is tight. He could mention his nan 10 times but then not in “post song interview” Sporting Bet decision final. I’ve taken it. The worry for me though is actually Dermot mentioning his nan rather than The Orange Lord himself. Oh dear! the lad just can’t help himself. – Unless the Daily Star leaks are false, it is very unlikely that Chris would lose sufficient votes to be 3rd placed, his Barlow duet will be a great boost, and he’s never been bottom 2. – Whether Jahmene’s vocal style is to your taste or not, he certainly can hit those golden money notes given the right material and we know from Leona Lewis/Alexandra Burke that’s a vote winner. I expect money notes a-plenty during his duet with Nicole, and he’s never been bottom 2. – As stated by annie in the first comment – James is niche – and like Jahmene he comes across as awkward when not performing – but Jahmene’s awkwardness is loaded with vulnerability and sensitivity – mums and grans are poised to lap that up. James is Billy Idol to Jahmene’s Billy Ocean, and he’s been in the bottom 2. Much depends on James Arthur’s presentation in the final. I’d liken it to meeting a girlfriend’s family for the first time at Sunday lunch – does he smarten up, use his serviette and eat his greens? In other words, will his sleeves be rolled down for once, will there be a conscious effort to disguise the ‘love’ and ‘hate’ ink on his knuckles and will he refrain from rapping during his performances? Probably not, and I fully expect Nicole’s duets to be very contrasting – warm, rousing and bonding with Jahmene but something current and edgy for James with little eye contact between them. To put it in ‘Grease’ terms – Nicole in white dress ‘Hopelessly Devoted to You’ with Jahmene, Nicole in black leather ‘You’re the One That I Want’ with James. I may be wrong but I was sure his tattoos said “Love” & “Life”. Totally agree with what you say regarding Nicole’s duets. Mine say “EURO” and “SONG”. I have MAL on my left buttock and NEY on my right one. Looking further to the press, lot of coverage for Chris and James but no Jahmene articles at all. I’ve had Jahmene earmarked as the winner since auditions for all the reasons you have listed Daniel. Ella was never going to win (as almost everyone predicted at the time), she had no where to go and I felt would never top her auditon. It could be argued she did at bootcamp but nothing after that came close. With Jahmene we all knew he had a voice but I sensed the opportunity for growth – the emotional “journey” so many of the winners have taken. Enough “big” notes at the weekend and he will win. One performance won it for Alexandra Burke, Jahmene could pull something as memorable out of the bag on Saturday. James was the one I didn’t expect to make the final and mistakenly had expected him to be the earlyish / midway “shock” exit. I imagine James has slowly climbed up placing order, he has grown on people more and more each week I think. I am more looking forward to seeing the voting PDF than the actual final! It should make for interesting reading and I cannot wait for the sofabet analysis. It is remarkable to think that the only act actually saved by the judges vote this series were Union J three times. Plus one on the final Neeve. Not that bothered on the show or outcome but can’t wait to see those week by week stats. Did Chris indeed win those early weeks? How much help did Jahmene need to make it too the final? Were they dampening Chris and did it work? I can answer all of that now. Did Chris win indeed win those early weeks? Yes. We’ve already basically established that much. How much help did Jahmene need to make it to the final? Impossible to quantify based on voting figures, as he was given the full sympathy treatment and major help right from the start. But based on his “biggest sob story ever” and unceasingly positive treatment combined with his divisive vocal style (which many find offputting), we can infer: a lot. Were they dampening Chris? Without a shadow of doubt: the scale has been unprecedented and relentless, on the main show, Xtra Factor and via the press. I have a feeling most of what you say is right Euro but I’m open to you being completely wrong too! We only have leaks to show Chris’s been pulling in the votes but other than knowing he’s been above bottom two all series we’ve no proof yet. I have a feeling Jahmene might have been quite neutral to start with and needed help to get to the final as their chosen one. I’ve also proposed that having Chris or Rylan in the final would be the only chance of generating talkability around the final will Jahmene beat James beat Union J is no real talking point compared to the massive Chris debate going on and the X Factor has always thrived on manufactured controversy. With Rylan’s vote soft and him being a sympathetic character Chris would have been the choice for that one. Again overdoing the criticism and creating an “anti-X Factor” vote is a well used trick, just not usually this far in the contest. Like i say I think you’re probably right but I don’t KNOW you are which is why I’m greatly anticipating the stats. All hail the Terracotta Warrior! Yes, he is a stand up comedian, known for using offensive material, very offensive. Mocking disabled people, babies etc. He is very clever, gets himself publicity by openly being abusive to celebrities in a humorous way (to his fans), but extremely offensive to the Celeb. Often forcing them to retaliate and he gets publicity from that. Superbly explained. Basically he’s a troll of the worst kind. He has (or had) the ability to be v satirical and incisive in almost a Brooker-esque way, but somewhere along the line he decided that gutter humour and being controvershul would get him more attention. Only let me stake max bet of £2.43! 2) he won’t win transfers from the third place act. Had James won the semis, I’d speculated the producers would let all three acts run to the final cut. James at 5-4 looks very short imo. Would this suggest Christopher is more likely to be ahead and it gives 24 hours for a straight choice between the remaining J & Oompta Loompa Man. They might restart the voting at that stage if desperate. …and probably an avalanche of Maloney negativity lined up for the Sunday papers! Negativity in, negativity out. You do not try to “stop” someone from winning. Fully caught up on X and Xtra Factor from the past couple of weeks now. On the latter show in particular, the constant drip-drip-drip of bile relating to Chris is both blatant and despicable, and the relentless pimping of James becomes unwatchable after a while. I don’t dislike him but they’re hammering it to death, Jahmene to a big extent too. Chris is spoken of begrudgingly and with open bewilderment in all contexts. The bias is apparent to all, so much so that when Olly and Caroline asked the panel on Sunday’s Xtra Factor about the negativity Chris has had in the press, Keith Lemon (hardly a font of wisdom) replied “Do you not think it’s quite negative to be asking us whether he deserves to be in final?” (or words to that effect, in reference to an earlier question). So much for a level playing field. James is getting the most pimping because he needs it the most, by some margin. He got the pimp slot and the most praise this weekend because with Chris and Jahmene firmly ahead of him, they needed to ensure he beat Union J in the vote and thus made it to the final. He will finish third on Saturday. I always assumed that the PIMP slot, was called the pimp slop previous because it was the last slot of the night, the closest to whent he lines open. Are we as sure it has the same effect as it did in previous years? I’m not so sure if it doesnt, the producers will be fully aware of this when they decide to put him on the latter stages. What I am suggesting is, maybe he doesnt need pimping hence their is no problem him being on last. I would suggest Jahmene got the most pimping last week and needed it most have a very poor week the week prior. I include the VT as well as song choice and stage production in my conclusion. Jahmene was pimped more than James in all areas for me. Also I want to point out, I am hardly ever critical of james as a big supporter throughout. But his version of U2-One was extremely average by his standards. I was very concerned at first hearing that. That was his first song of the two, the fact he still go through, i suggest it relied heavily on his second song choice. If being on LAST doesnt have the same advantage as the previous years, this could be quite telling, and could mean James is being under-estimated in the votes. James was in the bottom 2. The other were not. I am sure James bounced but I think he was third last week. I thought both songs were poor enough esp. One, which he destroyed. I think there is evidence that all the rubbish they are throwing at him has inflated his ego massively. Some of what he come out with this week has been nauseating. He seems convinced of his greatness. He is the man to put a stop to Frankie Boyle. Supermodels will be his dames now, no more the ugly ones. If conforming is required to get votes and win I do not think he will at this point. He will “James Arthur” whatever is put before him. In the case of One this meant singing an almost different song. At the time he most needs to win over casual voters he seems unlikely to do so. He is James Arthur you see. This is the James Arthur show. Tulisa will tell ya. You’re right that the traditional pimp slot is far more in question this year, so my referring to James being given the “pimp slot” (if such a thing still exists) was perhaps overly casual. He does need pimping though, otherwise they wouldn’t be doing it. Things we know: 1) Chris has led throughout the series followed by Jahmene in second place, 2) James came 5th in week 7 and was bottom two (neither of the others have been). I do agree with you that Jahmene has been pimped more than James throughout the series and given more help, including in the semi, again implying he needs it. I found it really interesting that a caller on Xtra Factor asked whether people are voting for “Jahmene the singer or Jahmene the story”. James has requires less of a sympathy grab – we haven’t had a great deal of sobstorification (my new word invention) – with him, it’s all about the supposed authenticity (#pain). Speaking of Xtra Factor, this is where James is pimped the most, more than on the main show. Every panel member, guest and eliminated contestant, almost without exception, enthusiastically names James as their favourite. Chris, meanwhile, remains a very conspicuous elephant in the room on Xtra Factor. There was a VT on Sunday’s episode where they asked a string of celebrities to say who they wanted to win, and the only two that said “Chris” were Stephen K Amos and Dean Gaffney (yes, that well-known arbiter of taste). They really did shovel it at Chris on the Xtra Factor, Gary even felt uncomfortable with the questioning and retreated don’t ask me, the public are voting, be interesting to see how they behave if Chris actually wins. I think like you that Jahmene has needed all the pimping, both he and James have, James still featured on YouTube home page from last weekend so those YouTube views well out in real terms and of course the “Royal Baby” news killed their PR presence all week, plays straight into Chris hands. Still like the Xtra Factor they will keep trying to get him, I don’t think they achieving that though mainly because the 2J’s not got the real support out there. They got their fans but not in enough numbers maybe. yes he was in the bottom two, but there is no question his popularity has increased greatly as a result. If anything that was the shock week that gave him some publicity. Take a look at his youtube views which ive already mentioned on here since that week. The week after bottom two for his two performances, aon the Tuesday, he was on 1.4mil and 300k views on youtube, no other act had over 200k views. That is significant, I admit that doesnt translate to votes, however a percent of them do. The increase in difference is huge. Continues this week, 900k and 325k, compared to 400k for the next. Prior to the week he was in bottom two, this gap was nowhere near as apparant, so must show he has increased since. So how much of a negative it is, I am not sure, yes it shows he was in the bottom two, but that was 2 weeks ago now, and its possible that favouritism has changed since. Aswell as you know Tulisa is going to banging her first on that table encouraging everyone in Britain to vote for James aswell as (assuming the trend continues) any guest act interviewed saying they love James and want him to win. Also, I think the fact they will be singing 3 songs is an advantage to James, compared to the other two he has shown he can sing a variety of songs (hopefully never U2 again) but has made songs “his own” where as Jahmene/Chris will no doubt be singing the same style/tempo song 3 times. One of Chris’ 3 will be with Gary Barlow so it does mix it a bit. I hope you are right as Jahmene is my enemy wagers wise and I am loath to lay off, though i really should. I say all this and I have been forced to lay some of my profits off if James wins 🙁 Hate doing it but has to be done to ensure profit all outcomes. Although a smaller one if Jahmene wins compared to the other two outcomes. Question.. the acts are dueting with their mentors, perhaps this is a stupid question. But has it been confirmed that it the duets are on the Saturdays show? and not the Sunday show. (IE if Chris left on Saturdays show, perhaps duet not relevant) Last years was on the Saturday so probably will be again. It must be Saturday if Nicole is doing two as James wont be there on Sunday. Only joking!!!!!!! Surely is Saturday though. You are right to lay off as it is truly difficult to call and I should do likewise really. Might just hold on until Saturday night before deciding. it is the thought of giving up profit that hurts but the profit is only notional of course. Won’t they only have two songs each on Saturday, including the duet? It will be the same number as last year I think Was that two? This is so they can allow for a million guest performers desperate to flog their awful records. Maybe 2 songs, thought it was 3, perhaps i am mistaken. 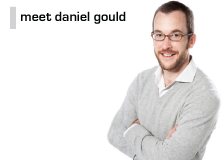 That’s a great headline Daniel.